New surgery table adn light with preroom next door. get all the spays and neuters done. 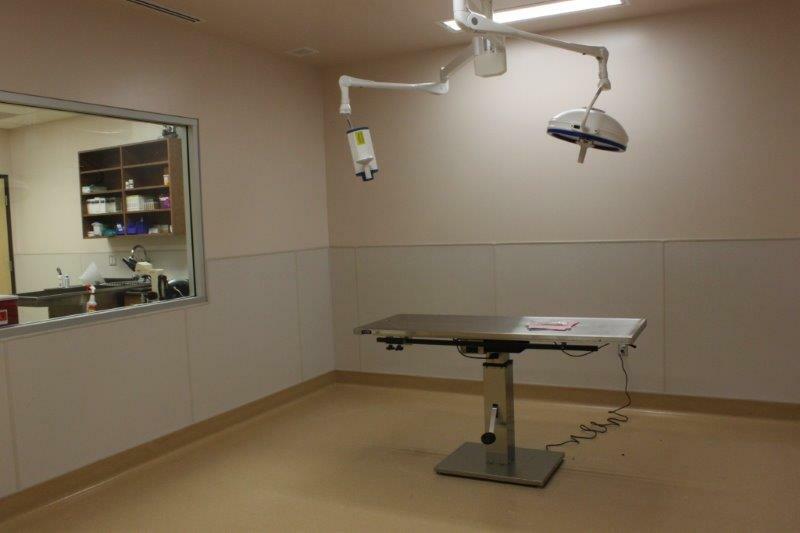 This space the key to reducing pet overpopulation and treating any number of conditions that arise including ultrasonic scaling of dog and cat teeth to freshen the breath of our canine and feline residents and improve their health. “Deputy Jeff” Lead fix it guy for all things PAWED at the new shelter. volunteer crew (Donna D., Bill Smith et al. pretty hard though, and they have even had to resort to weight training to keep up and they will hopefully be able to get some much needed rest for muscles and backs now that the majority of it is done and debugged. It has been a pretty massive project to extract and adapt equipment from the Mobile Clinic and get it up and running in the new space. 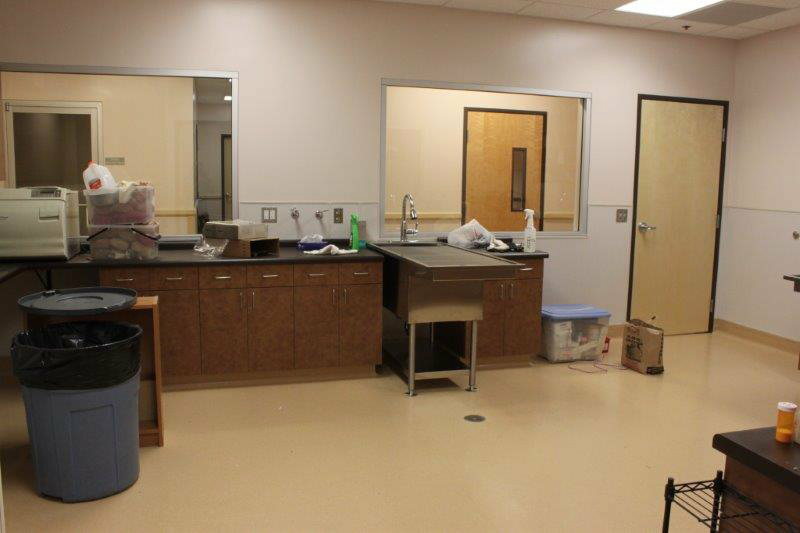 Check out this great gallery of photos by “Deputy” Donna that shows all the new equipment purchased through the PAWED Finishing Touches campaign and repurposing the Mobile Clinic equipment. They tell me that removing that decal was super tedious work with a heat gun and progress measured in millimeters per hour – it took a really long time to remove. Anyway this new space is super duper and will serve our community for decades to come. The new heated table so the animals do not get cold and shivery from the anesthetic. Surgery table #2 from the Mobile Clinic into the new space. 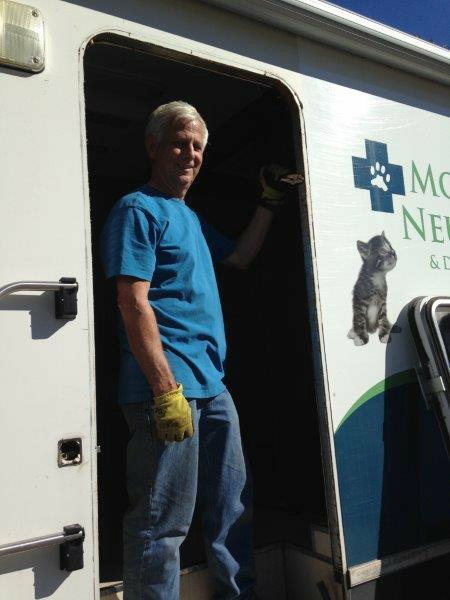 Door removal by Jeff and Donna to allow cages to be moved from the Mobile Clinic into the new clinic space. Jeff and Donna working on that door. Getting ready to remove the old stuff from the Mobile Clinic. The last road trip will net another donation from CARS. Decal removal was really Tough. John does a tough job with a smile. The cages were moved into the new clinic prep area and are a great asset. The dedication plaques moved too. Electronic scale outside the veterinary clinic area. The prep table is pretty much ready for its first customer.